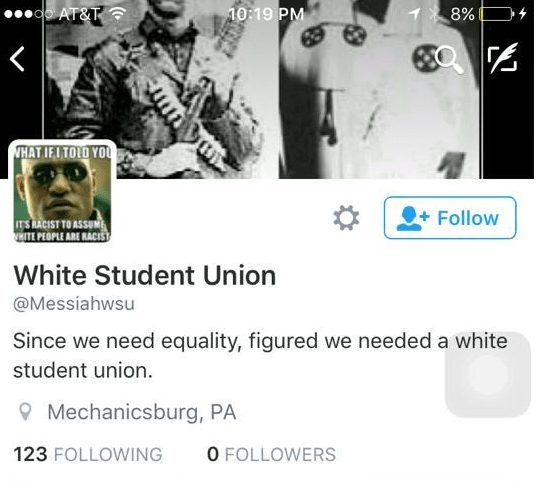 On Wednesday night an anonymous “White Student Union” twitter page was created with the handle @Messiahwsu. “I heard about it Wednesday night because a friend of mine sent me a message on Twitter after the individual who made the account had followed him,” says Black Student Union (BSU) President Naomi Henry. Director of Student Involvement & Leadership Programs, Kevin Villegas said that after college administration learned of the account on Wednesday night, key administration and educators met to discuss it on Thursday. “At this point, the college [has] no means of discovering the identity of the individual(s) behind the account,” said Villegas. Despite outcry from some students, Henry says the account cannot be opened for police investigation since no formal threat has been made. “If we receive information that provides us with a good faith belief that there is an exigent emergency involving the danger of death or serious physical injury to a person, we may provide information necessary to prevent that harm, if we have it,” reads Twitter’s guidelines for law enforcement. On Thursday night, Director of Diversity Affairs, Bernardo Michael, and Director of Student Involvement and Leadership Programs, Kevin Villegas, met with BSU regarding the “White Student Union” twitter page. Henry says both individuals expressed love and support for BSU members, while encouraging them not to further engage with the account. Villegas said the college plans to focus instead on holding programming to discuss the matter through the Cocurricular Planning Team. This is not the first time a “White Student Union” has been formed by individuals at a college or university. At Towson University in Maryland, student Matthew Heimbach formed a “White Student Union” (WSU) to advocate for “persons of European heritage,” says VICE.com. There were also multiple “White Student Unions” formed at Canadian colleges and universities and one at Georgia State University. “Nothing can really be accomplished in 140 characters, and someone hiding behind an account is obviously not very interested in learning. Instead of addressing the individual, the administration wants to pursue programming to educate the student body on the broader idea of white privilege,” says Henry. If students have any questions or would like to discuss the matter further, they may contact SGA Vice President for Diversity, Jocelyn Chavous at jc1468@messiah.edu, or Director of Multicultural Programs, Scott Hwang at shwang@messiah.edu. The Pulse will continue to follow this story as it develops. Check back with us on Facebook, twitter, and swingingbridge.messiah.edu for more information.